Cistena Plum in a grouping, as a screen or hedge, or in a shrub border. 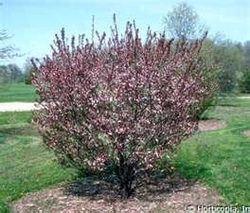 Cistena Plum is drought tolerant when it is established and is also deer resistant. It attracts butterflies, hummingbirds, and bees when in flower. Birds and wildlife are attracted to the berries. It is also a Firewise plant. Cistena Plum likes to be planted in full sun or partial sun. This plant is potentially poisonous and would be best not planted around farm animals, schools, or in landscapes where pets and/or children might ingest any part of the blooms or leaves.